375 East Wacker is a 76-story mixed-use skyscraper planned for the Lakeshore East area of Chicago. The façade will be mostly glass with limestone accents and the façade will be lit with LEDs which would change colors with the seasons. North Field Drive will pass under the structure. There will be a large cutout of about 20 floors in the middle of the building, something akin to the Grande Arche building in Paris. 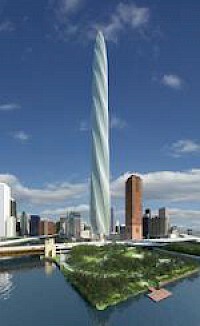 The Chicago Spire was a supertall skyscraper project at 400 N. Lake Shore Drive in Chicago, Illinois that failed financially after beginning construction. When originally proposed as the Fordham Spire in July 2005, the design had 116 stories and would have included a hotel and condominiums and been topped with a broadcast antenna mast. The design was by Spanish architect Santiago Calatrava, and Chicago developer Christopher T. Carley of the Fordham Company was spearheading the project. 55 East Erie is an all-residential skyscraper in Chicago. It is at 647 ft (197 m). 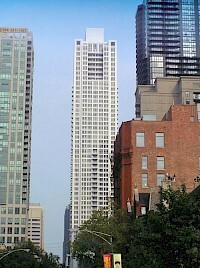 Designed by Fujikawa Johnson & Associates and Searl & Associates Architects, the 56 story building was completed in 2004 and is the third-tallest all-residential building in the United States after Trump World Tower in New York City, and the nearby 340 on the Park completed in 2007 in Chicago. The design called for flying buttresses around the mechanical penthouse, which were eventually dropped. 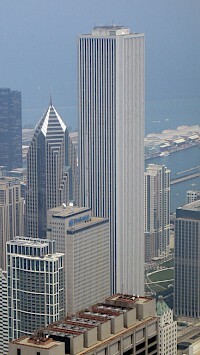 900 North Michigan in Chicago is a skyscraper completed in 1989. At 871 feet (265 m) tall, it is currently the seventh tallest building in Chicago and the 25th tallest in the United States. It was developed by Urban Retail Properties in 1988 as an upscale sister to Water Tower Place, one block southeast, and was the second vertical mall built along the Magnificent Mile. The building features a large, upscale shopping mall called 900 North Michigan Shops. ABN AMRO Plaza is an office building located in the West Loop area of Chicago, Illinois, United States. ABN AMRO, parent company of Chicago financial institution LaSalle Bank owns and operates the building. To the east sits Citicorp Center building and to the south, residential-complex of Presidential Towers. In the base of the building, there is a LaSalle Bank branch, a Starbucks Coffee and an Au Bon Pain restaurant. The Allerton Hotel is a 25-story 360 foot (110 m) hotel skyscraper along the Magnificent Mile in the Near North Side community area of Chicago, Illinois. It was the first building to feature pronounced setbacks and towers resulting from the 1923 zoning law. 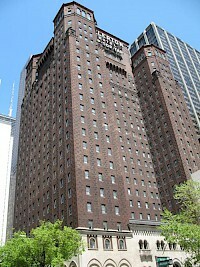 The building was designated a Chicago Landmark on May 29, 1998. When the Allerton first opened, it had fourteen floors of small apartment-style rooms for men and six similar floors for women, with a total of 1,000 rooms. The Aon Center (200 East Randolph Street, formerly Amoco Building) is a modern skyscraper in the Chicago Loop, Chicago, Illinois, United States, designed by architect firms Edward Durell Stone and The Perkins and Will partnership, and completed in 1973 as the Standard Oil Building. With 83 floors and a height of 1,136 feet (346 m), it is the third tallest building in Chicago, surpassed in height by the Willis Tower and the Trump International Hotel and Tower. Aqua is an 82-story mixed-use residential skyscraper in the Lakeshore East development in downtown Chicago. 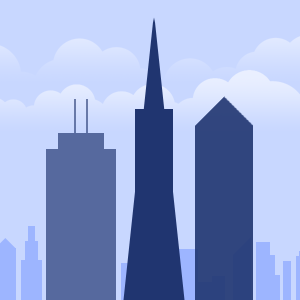 The building's height of 819 ft (250 m), includes six levels of parking below ground. The building's eight-story, 140,000 sq ft (13,000 m) base is topped by a 82,550 sq ft (7,669 m) terrace with gardens, gazebos, pools, hot tubs, a walking/running track and fire pit. Each floor will cover approximately 16,000 sq ft (1,500 m).